A good outfit is something that makes you look good, feel confident and comfortable. It’s a style to express your identity and social prestige whether you adopt western outfits or traditional Indian outfits. Indian ethnic wears have unique significance in our lives that keep us connected with our traditions and culture. Rajasthani Sarees offers an exceptional collection of Indian wedding outfits and home furnishing that will rejuvenate your sense of fashion and elegance. Especially for women we have an exclusive section that includes class-apart ladies apparel, bridal outfits and the best home furnishings. Rajasthani Sarees is one among the leading Indian clothing and home furnishing stores having most stylish, designer and cost effective alternatives. On this online Indian clothing store you can buy Indian apparels and affordable home furnishing products from the vast range. Sarees offers a lovely combination of design, color and fabric. The Party Wear Sarees look elegant and fascinating. These Party Wear Sareescontain different types of thread works. The Indian Party Wear Sarees are made of different fabrics like silk, georgette, chiffon, crepe and many more. We are specialists at embroidered lehenga cholis that are widely used as the bridal wear. The bridal apparel is still considered as the greatest significance in the entire marriage ensemble. We believe rich embroidery is the best way to decorate the dress. 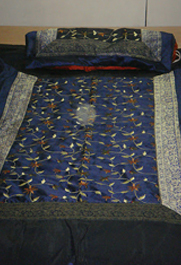 Art of tie and die is popularly known as Bandhej in the region. While tie-and-dye is a fairly common textile tradition, Bandhni, also called Bandhej, holds pride of place in India. 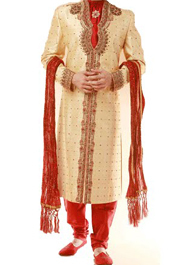 Salwar kameez is the dress worn by women. From the last century, the ladies of India have also adopted this dress in place of sari, the traditional dress of India. Salwar are loose pajama-like trousers. There is no such definition for the kurti. To define it would be to put it within boundaries, and one cannot really do that to the kurti. For it exists in many colours, many styles, and in many forms. To cater to the diverse needs of our clients, we offer an assortment of Poly Silk Home Furnishing items that help enhance the décor of an abode. Offered in various prints and designs, these silk home furnishing items are popular in the domestic as well as international markets. For many years we have been developing products in specialized areas such as hand embroidery, appliqué, patch work etc which now constitute a significant part of its product range. We take pride in our finished products, to maintain premium quality we use the best raw materials available in natural fibers, resulting in our products being attractive in appearance, durable over time and most importantly competitively priced items.